Legends, upstarts, and an honored but absent guest at this year’s festival. Sixty years ago this summer Miles Davis made his first appearance at the Newport Jazz Festival. It was the first of several notable appearances by the legendary trumpeter, and this year the festival commemorated the occasion with a host of performances and ancillary events to mark the anniversary. 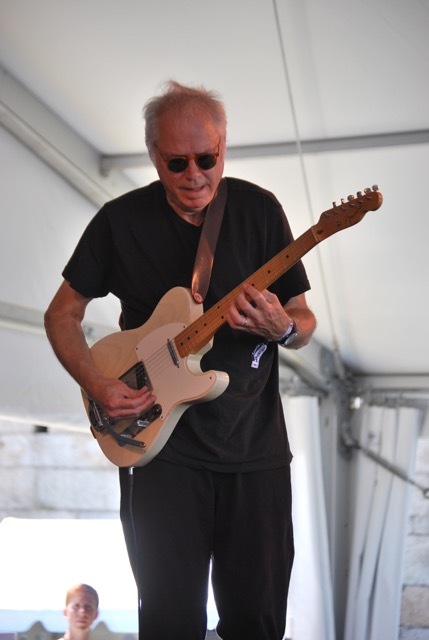 To one degree or another nearly every performer at this year’s festival had a direct or indirect connection to Davis, or at least bore some degree of his influence. John Hollenbeck has a big band, and when a big band is late for their appearance on the festival’s main (Fort) stage, it can create all sorts of problems. In this case the primary result was that Hollenbeck’s set was shortened. It was a shame because the the 20-piece unit, with Hollenbeck on drums, played marvelously inventive and unexpected takes on classic tunes by Jimmy Webb (“Up, Up and Away,” “Wichita Lineman”), and Burt Bacharach and Hal David (“Close to You”). A song called “Constant Conversation” was dedicated to the weekend’s absent guest of honor, Miles Davis. The Christian McBride Trio played one of my favorite sets of the weekend. It was distinguished by the brilliant playing of all three musicians — in addition to McBride the trio included the talented young pianist Christian Sands, the monster drummer Ulysses Owens, along with bassist McBride’s outsized personality. 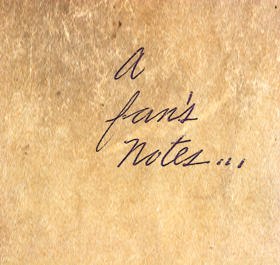 Selections included Wes Montgomery’s “Fried Pies,” J.J. Johnson’s lovely “Interlude,” and Rod Temperton’s “The Lady in My Life,” which many in the crowd recognized as the final song on Michael Jackson’s Thriller album. 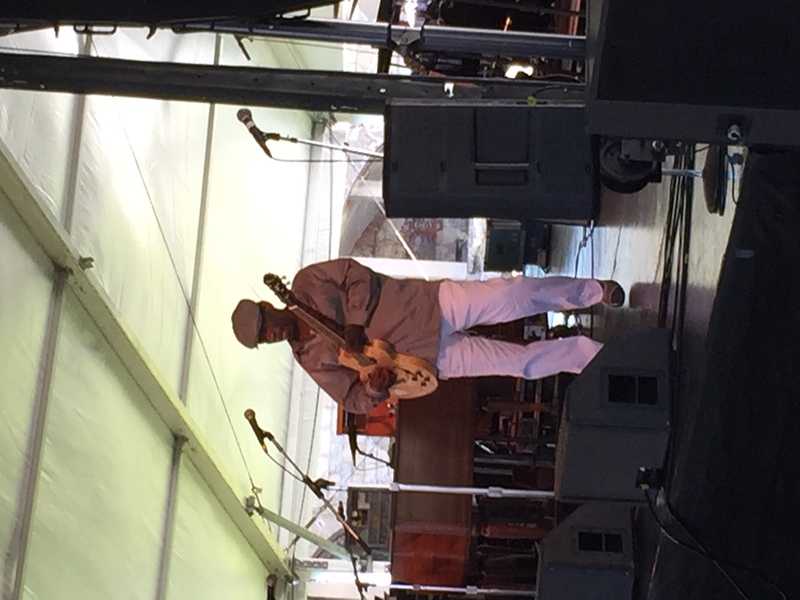 McBride had the audience singing along with a spirited take on “Car Wash” to close the set. Here’s a rough video I shot. The Friday evening concert is always very special, taking place as it does on the lovely grounds of the Tennis Hall of Fame. The evening’s bill promised music that would be more than a match for the august surroundings, and delivered on that promise. 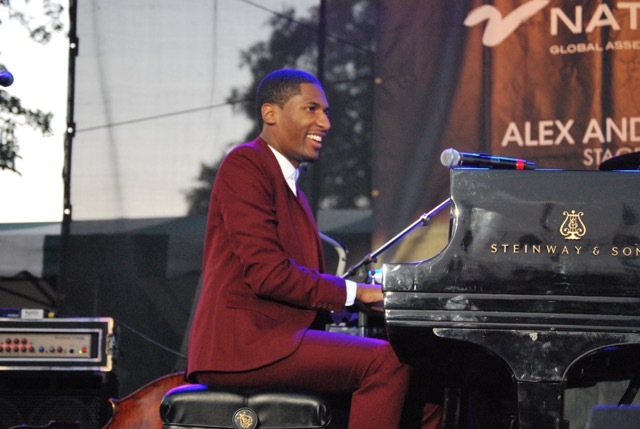 Opening the show was Jon Batiste, who was recently named bandleader for the Late Show with Stephen Colbert. 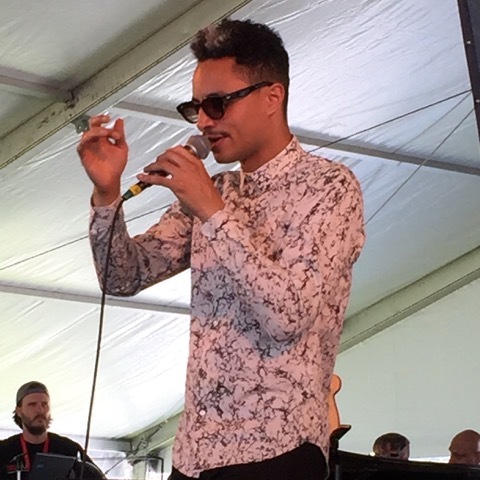 Batiste has become a Newport regular, becoming the first artist to appear at both the Folk Festival and the Jazz Festival in the same year. Batiste’s festive Stay Human band was augmented by several musicians for the Friday night show, most notably sax player Grace Kelly. Batiste’s set included unique takes on American Songbook classics like “Where or When,” “Love for Sale,” and “Somewhere Over the Rainbow,” along with a lovely tribute to his home away from home, “The Newport Suite.” People have been talking about Batiste’s potential for a few years now. That’s all over now. He’s arrived. Jon Batiste. Photo by Nikki Vee. Chris Botti. Photo by Nikki Vee. 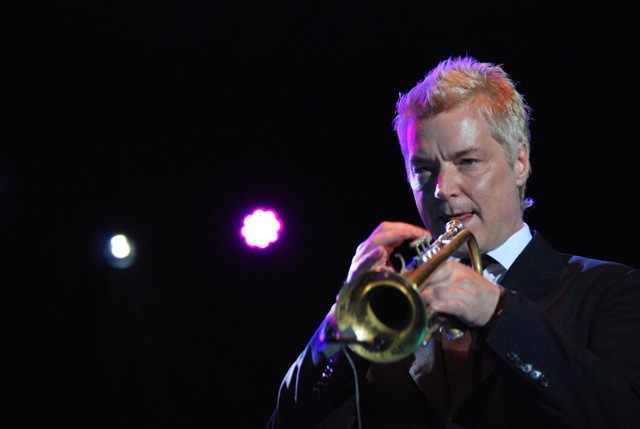 There is no denying the talent of Chris Botti and his band. Some my not be comfortable with what they see as the too-slick show biz aspects of his performances, but his style seemed perfectly appropriate for the venue. His set opened with a nod to Miles Davis, “Concierto de Aranuez,” and included dramatic takes on well known songs like “The Very Thought of You,” “The Look of Love,” and “The Nearness of You.” The thundering take on Led Zeppelin’s “Kashmir” was an interesting change of pace, and the appearance of violinist Lucia Micarelli delighted fans of the HBO series Treme (she played Annie) as well as others who were previously unfamiliar with her. It was back to the cutting edge to open the proceedings back at the Fort. The difference was that this time the it took place on the main stage, and this time it wasn’t young musicians, but a group of elder statesmen who were testing the limits. 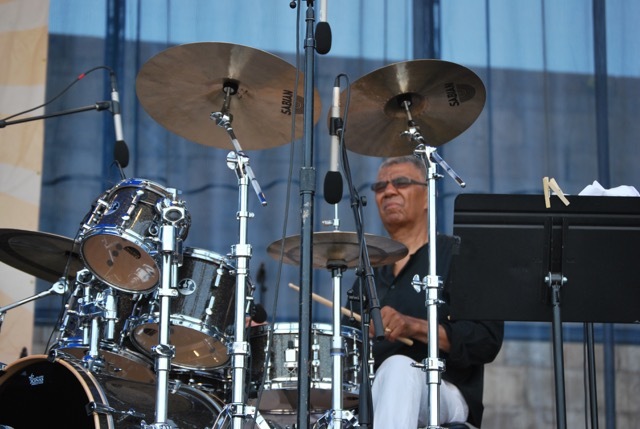 The group was led by the legendary drummer Jack DeJohnette and his Made in Chicago featured an all-star lineup of Windy City musicians that included revered names like Roscoe Mitchell and Henry Threadgill on woodwinds, pianist Muhal Richard Abrams, and bass player Larry Gray. Jack DeJohnette. Photo by Nikki Vee. The only word I can use to describe their performance is thrilling. Here are a group of guys who have reached a certain age and they simply refuse to back down when it comes to the music they want to play. Whether is was Abrams silvery, cascading piano runs, Mitchell and Threadgill’s intensely felt solos, or DeJohnette’s powerful drumming, the courage of their convictions was on full display and again the Newport audience showed their overwhelming appreciation for music that was never easy, and never cliche. The first Miles Davis seminar of the weekend featured an appearance by venerated festival founder George Wein who was interviewed by his biographer Nate Chinen. Wein didn’t make it easy on Chinen, balking at some early questions and correcting the writer on others, but he showed his irrepressible good humor (at age 90) throughout, and shared some great stories of his long relationship with Davis. Although their friendship was not always easy over the years, their respect for one another was undeniable. Cassandra Wilson. Photo by Nikki Vee. 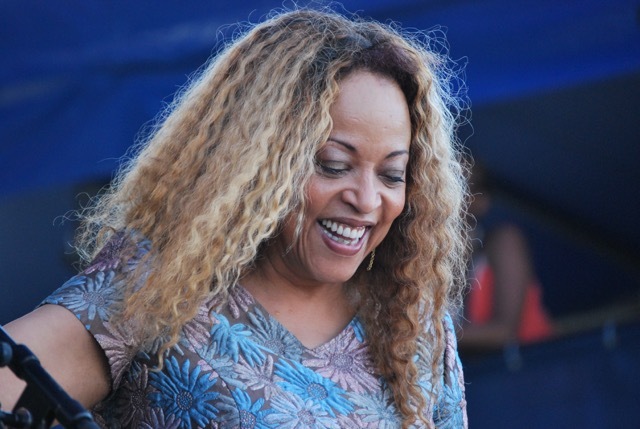 Cassandra Wilson appeared on the main stage with her deeply felt tribute to Billie Holiday. Her set included Holiday classics like “Don’t Explain,” “Good Morning Heartache,” and “All of Me.” A number of singers have paid faithful tribute to Holiday in recent years but Wilson’s interpretations were special because they are anything but standard. Her innovative approach to the material breathes new life into familiar music. Sax player Kenny Garrett was another Miles Davis veteran on the bill and although he played on the festival’s smallest (Harbor) stage, he gave one of the weekend’s most rousing performances. Garrett showed off some of the sax power that got him the job with Davis, and was joined by lively percussionist Rudy Bird, pianist Vernell Brown, Corcoran Holt on bass, and drummer Marcus Balyou. Their set, which included “J. Mac,” “Happy People,” and “Wanne’s Thing” could have been a few minutes shorter (they played one of the only encores I saw all weekend), but had the crowd dancing in the aisles and chanting along. Despite the fact that some of the music I had most anticipated was scheduled for Sunday, I didn’t make it out to the Fort. After five long days of festival-going in a ten day period I was sunbaked and foot sore. I can offer some photos from the Sunday performances though. You can find them below. For a larger image click on any photo. 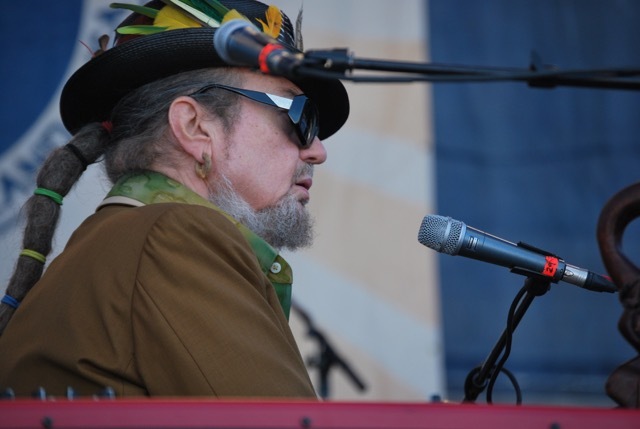 Dr. John. Photo by Nikki Vee. 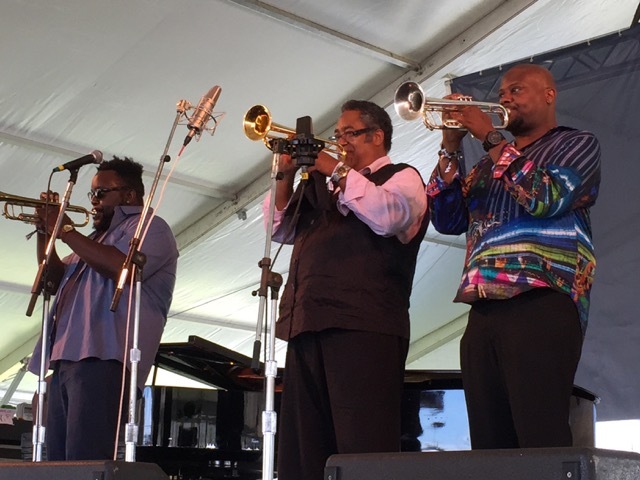 Marquis Hill – Jon Faddis – Sean Jones. Photo by Nikki Vee. Bill Frisell. Photo by Nikki Vee. 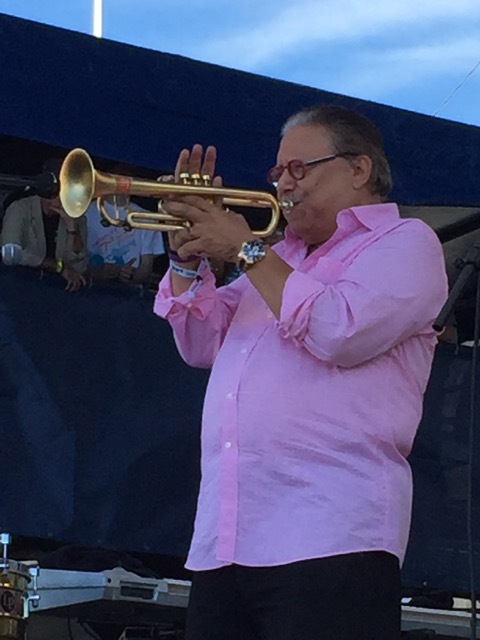 Arturo Sandoval. Photo by Nikki Vee. 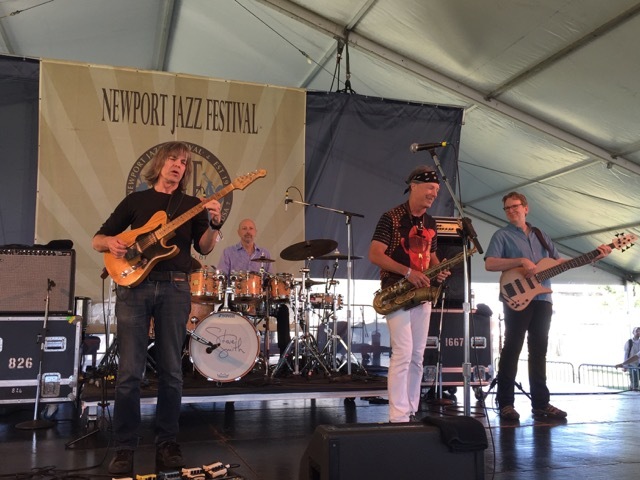 Mike Stern – Steve Smith – Bill Evans – Tom Kennedy. Photo by Nikki Vee.